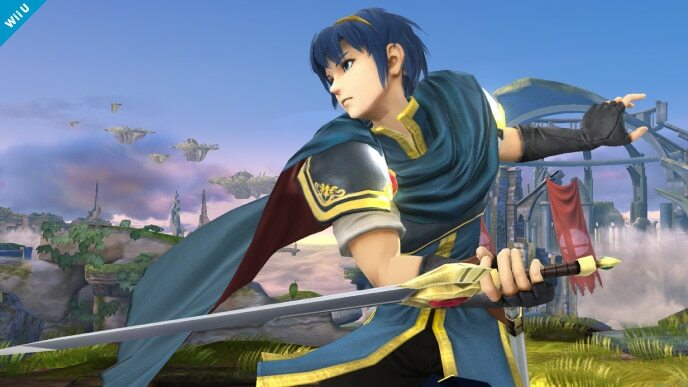 The first hero from the Fire Emblem series, Marth is the prince of Altea and descendant of the hero Anri. He’s known as an exceptional swordfighter, swinging his blade with grace. He and a small group of stalwarts fought to free Altea after it was invaded by the kingdom of Doluna and the dark dragon, Medeus. Marth possesses two specific tools that make him an extremely formidable opponent: his down special, Counter, and his side special, Dancing Blade. Counter is especially effective against powerful foes like Bowser and Ganondorf, and it can even turn the tide of battle in Marth’s favor. Marth’s AI uses Dancing Blade brilliantly, never failing to link all four hits together; the attack is so fast that his opponents will often to fail to block it in time. When tipped, Marth’s smash attacks are incredibly strong, and can KO enemies at disgustingly early percentages. 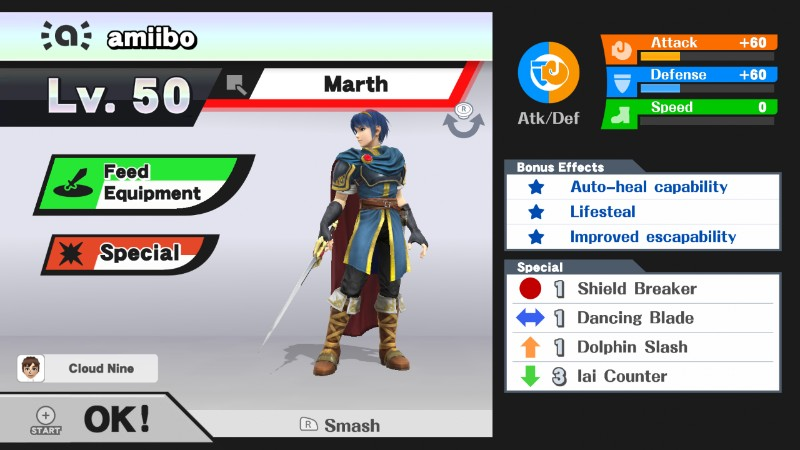 In general, Marth’s tipper mechanic works in his favor – but only as long as his trainer can properly use them. 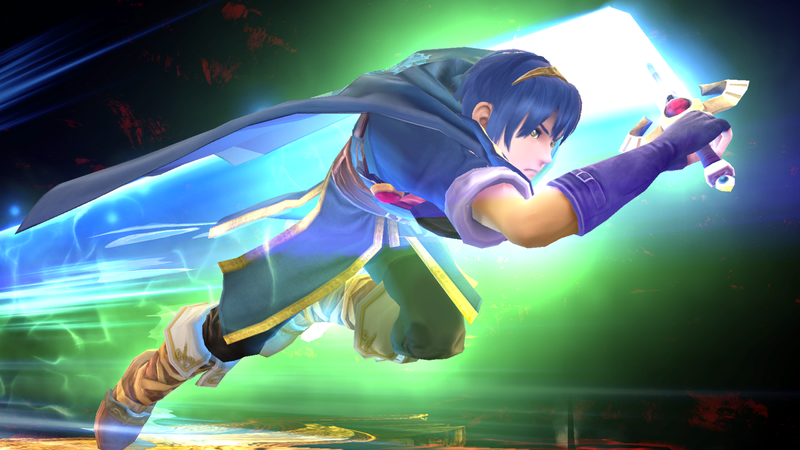 While Marth has many strengths, he has just as many flaws holding him back from greatness. Marth’s AI has a few minor flaws; he gets greedy with his tipped aerials, and he eventually learns to spam them unless proper precautions are taken. He can also become too reliant on his counter at times, and this may lead to him whiffing the hitbox and getting punished hard in return. Marth’s tipper mechanic can also be a bit of a double-edged sword; if Marth is unable to properly space his tippers, KOing enemies becomes very difficult. Overall, Marth is a great amiibo who can tear unprepared opponents to shreds and easily turn the tide of battle thanks to his powerful tipper mechanic and fast attacks. It’s difficult to get him into the habit of properly spacing his tippers, but if he learns to master this skill, he’ll go very far – maybe even all the way to grand finals. Iai Counter: This is a custom move version of Marth’s down special. It’s stronger than the default version, making it an easy pick. When selecting this custom move, be sure to carefully read the rules of tournaments you’re entering: some of them ban Marth from using Iai Counter. Neutral options: Dancing Blade. While Marth’s jab and forward tilt are useful, Dancing Blade outclasses them both. Its incredible speed means that opponents will have trouble blocking or dodging it. This is Marth’s most important move, so teaching him to use it properly is key. If you can’t consistently link all four hits together, don’t worry. As long as you can do it sometimes, you’ll be good to go. Main KO moves: forward smash and down special. Marth’s forward smash is immensely powerful when tipped – if there’s any one move you need to teach your Marth to space properly, it’s his forward smash. Use it against your amiibo when he’s at high percentages. The tipper on his forward smash is at the very edge of his blade, just a smidgen away from the blue trail it creates. Counters are also a big threat in the competitive amiibo metagame. If Marth can pull off just one Counter against a powerful character like Bowser or Marth, they’re either going to be KOed or suffer major damage. Use Iai Counter several times per mirror match to ensure he learns it. Use slow mode if you’re having trouble getting the timing correct. Moves to avoid: neutral special. 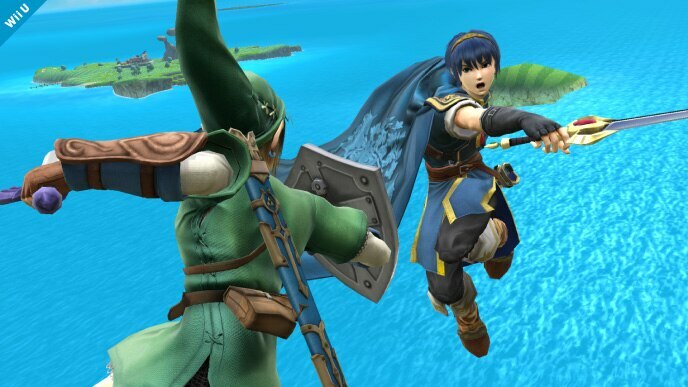 Marth may learn to randomly use this attack while in midair, so ignoring Shield Breaker entirely is your best bet to ensure he doesn’t use the move at an inappropriate time. Thanks to Blue for compiling Marth’s information. Images are courtesy of SmashWiki and the official Super Smash Bros. website. Marth amiibo tend to get a bit jumpy after fighting over amiibo, so I suggest mirror matching him a couple of times in a row, stay grounded, and punish all aerials.